One of the best things about living on the Bay of Naples is that there are so many places you can go to by boat. Try a spa on Ischia, do some shopping in Sorrento, see the Blue Grotto on Capri, or have lunch on Procida. Long distance ferries will transport you to Palermo or Catania in Sicily, Cagliari on Sardinia, the Aeolian Islands, and the Pontine Islands. Although there are no direct routes, you can also make your way to Positano and the Amalfi Coast. Numerous high speed hydrofoils (Aliscafi) and passenger and car ferries (Traghetti) leave from Naples Ferry Ports, Molo Beverello, Mergellina and Pozzuoli everyday. There are many carriers and their schedules vary by the day of the week and the season so it’s best to check the full schedule in the Il Mattino Newspaper or the Port of Naples, or if you are feeling adventurous, head to the port and grab the next boat out. Alilauro Hydrofoils from Naples Beverello and Mergellina to Ischia, Sorrento, and the Aeolian and Pontine Islands. Alilauro also has several other routes around the Bay of Naples and the Sorrentine Coast. Gescab Hydrofoils from Naples Beverello to Sorrento and other routes between Sorrento, Capri, Ischia and Castellamare. The website is in Italian only and online booking is not available. Medmar Ferry services from Naples Beverello and Pozzuoli to Ischia and Procida. The web site is in Italian only but online booking is available. Navigazione Libera del Golfo Hydrofoils from Naples Beverello to Capri and other routes around the Bay of Naples and the Amalfi Coast. The web site is in Italian only but online booking is available. Siremar Ferry service from Naples to the Aeolian/Lipari Islands of Filicudi, Ginostra, Lipari, Panarea, Rinella, Salina, Stromboli and Vulcano. The web site is in Italian only but online booking is available. 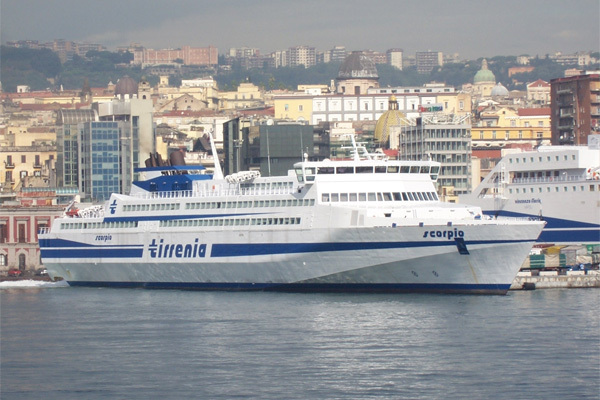 Tirrenia Ferry services from Naples Ferry Port to Palermo, Sicily and Cagliari, Sardinia. The web site is available in English and has online booking services. TTTLines Ferry service from Naples Ferry Port to Catania, Sicily. The web site is available in English and has online booking services. Volaviamare Ferry services around the Bay of Naples, the Sorrentine and Amalfi Coasts and the Aeolian and Pontine Islands. The web site is in Italian only but online booking is available. Napoli Apartments is a brand of Boundless Housing s.r.l. Here you can book your apartment in Napoli at the best price on the web. © 2019 Napoli Apartments - Boundless Housing. All rights reserved.